Focusing my passion for the motorsports industry helps to keep monotony at bay and allows my mind to be enthusiastic about finding new ways to view different topics, learn something new, and dive headfirst into new experiences. In this unique position as one of the content creators here at Front Street, I have the opportunity to broadcast my passion both visually and written for all to see, and I’m privileged to retain these memories for the rest of my life. Sometimes I don’t get to share some of the memories in order to keep event coverage on topic, but with the end of the year quickly approaching I wanted to take a look at the articles I’ve created on Front Street over the past year to relive some of the standout moments from a different perspective. Last winter, I took the trip across the Delaware River to New Jersey where I had the opportunity to tour Interstate Motorsports, who specializes in nostalgic supercar models like the Lamborghini Countach and Diablo. I had seen quite a few images of this location on different social media channels before my visit, but nothing can prepare you for the childish giddy feelings evoked once you are exposed to the massive room full of exotic machines. At first, the sight of so many of these cars organized so close to each other doesn’t equate to reality – they even look like toys in my images. As children, we’ve parked them next to each other on our parents’ carpet, or driven over them with our favorite monster truck toy, but it’s a rare sight to glimpse them in their actual size, assembled in such numbers, and in such incredible condition. I have known Mike Jardel for quite some time, and I was actually first introduced to him the day he purchased this white Honda Civic – I’ve followed along with his build and had the opportunity to witness this car take shape over the years. I was there to help with all of the rebuilds, the engine swaps, the new parts, and the decision-making process which preceded each change. We have both grown as people, while the car has aged and seen new life countless times over the years. It was an honor to write about his journey with the car and share his story with all of our readers. Hopefully it inspired some of you not to give up on your weathered cars, and to restore them to their intended glory. Attending the New York International Auto Show has become an annual tradition for my friends and I – we take the train up to Penn Station, walk a few blocks in the cold weather to the Javits Center, then spend the rest of the day navigating the insane crowds of people in order to see the newest vehicles from our favorite automakers. This past year was a little different as I applied for media access, which granted me a look at the event I hadn’t encountered previously. For example, the event floor was much more open because there were only accredited media professionals allowed to attend on the media days. But getting an open shot of newly unveiled models was just as hard, as there were hundreds – if not thousands – of other people all there for the same reason: to capture images and video of the new cars. Anyway, I still remember turning the corner and seeing the new NSX production car and its GT3 racecar variant in the Acura booth. As a longtime Honda enthusiast, it was a pretty meaningful scene for me. Not so much for laying my eyes on the cars, because I had already seen images of them plastered all over the Internet, but because I was present for such a monumental occasion. I think about the unveiling of the first NSX decades ago, when I was much too young to attend, and how I can say I was present when the second generation of the production NSX was revealed in New York. That’s pretty cool to me. I enjoy motorsports the most out of any automotive-related activity, without question, and observing the highest-horsepower drift cars on the planet as they attempted to navigate the rainy Long Beach Grand Prix circuit was quite a memorable occasion. Long Beach doesn’t see much rain, and when it does rain, the ground is so dry and solid, the moisture can’t absorb into pores in the ground. Instead, the water just floats on top and mixes with all of the foreign contaminants that have never been washed away, creating a challenging race surface. In the case of a street circuit like the Long Beach Grand Prix course, the blacktop that layers the racetrack consists of publicly used roads, which over time collects its fair share of grease, oils, and other substances. So when the rain began early in the Formula Drift weekend, it combined with the contaminated asphalt to create a slippery mixture that might as well be ice. Tire technology has come a long way in recent years, but even the newest rubber recipe couldn’t help plant 1000-plus horsepower drift cars on a racetrack covered in oily water. The mixture of professional drivers and professional drifters separated, as true car control was needed to complete a route through the slippery hell. Nearly every driver wrecked that weekend, and more water spray escaped into the atmosphere than tire smoke, but it was still a drifting event I won’t forget. Oh, and I was soaked by the end of it, so I’ll remember that, too. I yammered for a few thousand words about how important the RAUH-Welt build was for me to witness in the original article, so I’ll keep it short here and just reminisce over these images I asked to take of Nakai-san’s most trusted tools after he had completed the build. I had no idea there was a book about him, or that the cover of the book was a picture of his hands when I grabbed these pictures. They just really are the perfect symbol for the passion and enthusiasm he exudes for building cars. His techniques may be a bit rudimentary given the price tag associated with such a build, and he may not have been the original designer of the look of the kit, but there is no denying his direct influence on the modern automotive scene. And the production of his cars has never been diverted into any other hands. They show incredible wear and tear and are permanently stained darker from grease, dirt, spray paint, and other substances connected with building cars, but Nakai-san’s mitts have physically sculpted the current trends of the automotive world we live in, and that is why this moment is unforgettable. The annual Boxerfest event in Maryland collects the Mid-Atlantic region’s Subaru enthusiasts in droves for a day of appreciation of their horizontally-opposed engines. This year the forecast called for rain, and rain it did. The sky was covered with dark storm clouds, the air was filled with falling raindrops, and yet attendance numbers still eclipsed all previous years regardless of weather conditions. The overwhelming dedication these automotive enthusiasts have for their brand is marvelous to observe. The Formula Drift series has been under a lot of pressure from its fan base due to the outrageous horsepower battles and claims that speed is becoming more important than the style that originated the sport. While I am still a believer that style is more important, I couldn’t help but watch in complete awe as Dai Yoshihara battled Mad Mike Whiddett under the lights at Road Atlanta. The issues surrounding style and speed took a backseat as I watched two of the sport’s most diverse entries (and most popular personalities) battling for a spot on the podium. We are in the Group-B era of drift cars right now, with drivers, chassis, and powerplants from all over the world. If we could put aside the complaints about the rulings, we would all realize how incredible the sport really is right now. I was watching a Japan-born driver; as he piloted a widened US-based Subaru BRZ chassis converted to a right-hand-drive steering layout, being powered by a turbocharged 1000-plus horsepower American Chevrolet LS engine. His opponent was an Australian-born driver; piloting a new widened right-hand-drive Mazda Miata chassis, which was being powered by a turbocharged and nitrous injected four-rotor Mazda rotary engine. Say what you want about the series and its direction, but in a sea of increasingly ‘Spec’ racing classes where all entrants need to match, Formula Drift’s lax rulebook is a refreshing break that allows a wide variety of modification not found in other racing series. In the future when professional drift cars look like NASCAR entries using the same tires with identical engines, and the advantage all comes down to driver/team edge, we’ll all look back on this as the golden age when anything was possible. Ahhh yes, Pikes Peak. I can’t possibly pick one exact moment from Pikes Peak, I can only recall the event as a whole. This has been a bucket list trip for me since I was a small child virtually driving the course in the Gran Turismo video game series, and to experience the event in real life took my appreciation for the insanity that happens on that mountain in Colorado to another level. 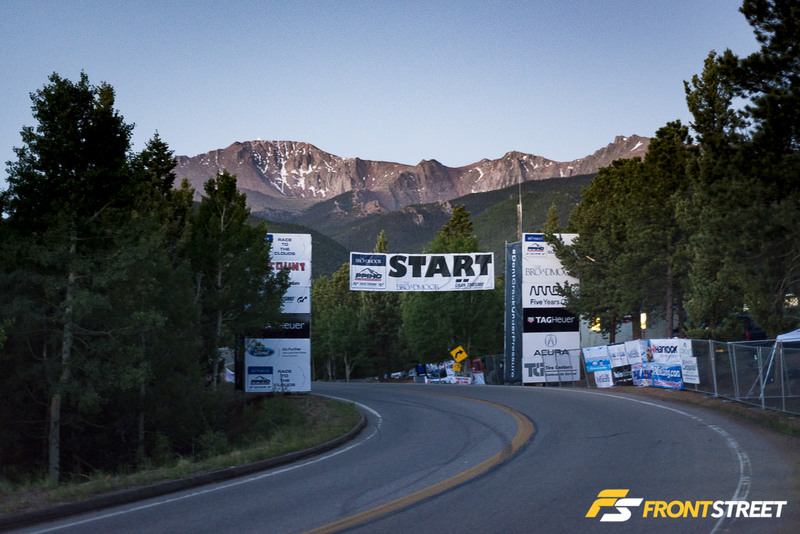 First things first: if you’ve never been to Pikes Peak, the one thing you need to know about the event is that your internal clock will need a serious resetting after it’s over. Because the hill climb takes place on a publicly used road that is vital for tourism money – a major influence in the city of Colorado Springs’ funds – the park refuses to close it for more than one day a year. This means all of the practice sessions, loading and unloading of the cars, and testing before the actual hill climb event must be conducted in the middle of the night into the early morning. An average day at Pikes Peak begins at midnight and is finished by 9:00am when the park opens. In those hours I experienced bone-chilling cold temperatures, a myriad of exhaust tones creating a daily morning soundtrack, and one of the most breathtaking sunrises I’ve ever seen. Driving up the road before and after testing is also one of the scariest things I’ve ever done – I might have maxed out my speed at 8 mph. In no way, shape, or form, should this dangerous road be a racetrack, but it is, and it’s absolutely glorious. The 4-Wheel Jamboree is an event crawling with trucks and their attendant fan base, and it was definitely a step outside my comfort zone as a sport compact enthusiast. While at the event, I got torched by the sun but was able to watch 10,000-pound Monster Trucks use 1,500 horsepower engines to launch themselves into the air, repeatedly destroying pieces of their chassis in the process. During their freestyle runs, the drivers would skyrocket a couple stories into the air and kick up clouds of dirt after colliding with the ground. They would also make special trips to the edges of the sanctioned area to litter spectators in clumps of mud and dirt, and you know what? Everyone loved it. Where else do you get to see gigantic trucks with this kind of reckless abandon hurdling through the air? Quite the sight. My first time ever leaving the United States was earlier this year, when I had the opportunity to cover the Montreal Formula Drift event in Canada. Prior to this trip, I never had a reason to own a passport, and had never experienced life outside the United States. The cool part – for me – about Montreal is that its inhabitants are French-Canadian. So there were signs, store names, and restaurants all written in French, which would have made navigating the city difficult had it not been for an English-speaking GPS system. It was at this event that I experienced my first taste of not knowing a native language and truly feeling like an outsider. When I shoot a venue for the first time, I like to walk around the entire grounds first and get a sort of lay-of-the-land. This prevents me from feeling lost later, and lets me plan my route of where I want to shoot photos, and when. Early in the day, I was walking the perimeter of the track at the Autodrome St-Eustache, when I paused along the fencing to watch the cars fly by me at the closest proximity possible – another quirk I have when attending events. While standing with my phone reached out to the fencing, recording the blur of drift cars passing me by, I was confronted by a burly member of the track’s security team, speaking very loudly to me in French. His gestures were semi-threatening, but I couldn’t understand what he was saying, so I just kind of froze in place. I had no idea how to respond and was physically speechless, as I wasn’t sure if any movement would be misconstrued. I stammered to get any words out, and all my mind could formulate was “E-English?” At this point, the guard very politely asked me to move away from the fence, and explained I could only stand there if I was wearing my media vest. I immediately moved away, got my media vest from my bag, and continued exploring the track. I ended up shooting the above photographs from this exact spot in question, but it felt so strange to feel guilty of something with absolutely no idea how to respond to a questioning authority figure. It was my very first personal experience with a language barrier; luckily I wasn’t doing anything seriously wrong, and the security personnel could speak English. I can only imagine how confusing it could get if I were in the wrong place at the wrong time in a foreign country. As part of an attempt to enrich my automotive perspective, I volunteered to cover the NMRA/NMCA Super Bowl of Street Legal Drag Racing in Joliet, IL. The entire weekend was filled with massive engines with more cubic inches in one event than I’d probably ever seen in my life. Gigantic superchargers rest atop many of the engines, while many others were force-fed air by way of large turbochargers. The entrants ranged from full-bodied nostalgic street cars to carbon-fiber-bodied Pro Mod contenders, each vying for a chance at taking home a coveted Super Bowl Ring in their respective classes. My favorite portion of the weekend was during the Radial Wars class, which doesn’t permit wheelie-bars. When you combine monstrous horsepower numbers with lots of grip in a rear-wheel-drive car, only one thing can happen; wheelies, and lots of ‘em! As the sun began to set over the racetrack, these machines lifted their noses one-by-one in the golden sunlight. First Class Fitment is a memorable event for me every year. It not only assembles a heap of my friends from all over the East Coast into the same parking lot, but also gives me an alternate perception of what it takes to create an event of this magnitude from scratch. Each year I observe the event’s founder, Dave Tormey, go through hurdles with the local Police Department, surrounding business owners, and the signing of multiple permits and insurances. Once that is all finished, he can concentrate on organizing, and accepting or denying more than 1,000 vehicle registrations. Once that portion of event organization is finished, he gets to figure out a plan to park the 350 accepted vehicles with seven different waves of entry time, in linear spots using only a Google Maps aerial view of the airport grounds. Then it’s just processing payments, seeking vendors to fill up booths, finding a DJ, getting signage made, meeting with the airport owners, and more. And that’s just all leading up the event; this doesn’t include the inevitable hiccups the morning of the event, the judging of the award winners, and the post-event cleanup which takes place deep into the night. It’s a full-time job in itself, and for someone with his own full-time job elsewhere, the event continues to attract an overwhelming amount of attendees each year. So when a group of Mazda RX-7 owners from Texas elected to take the 1,600-mile, 25-hour trip up to New Jersey for his event, I could tell it was a personal triumph, that something he poured so much work into creating had reached a level that people from Texas would drive to attend it. Seeing the lineup of RX-7s outside the hangar was the symbol of his hard work come to fruition. The cars themselves weren’t so bad either. I made the trip to Las Vegas for the second time to attend this year’s SEMA Show. I was vaguely more prepared this time compared to the previous year. I had my comfortable running shoes on and knew my way around so I wouldn’t have to walk in too many circles through the various halls. The issue was that an entirely new fleet of cars populated the event floor, so navigating to find the gems would require just as much work as it did in 2015. I meandered my way through hundreds of different booths until setting my eyes on a familiar piece of Japanese automotive intricacy: the Kuhl Racing Nissan GT-R with bodywork from ARTIS in Japan. The pictured gold Nissan GT-R is a completely separate car from the silver iteration displayed the previous year. The bodywork starts by first fitting a Kuhl Racing widebody kit and spoiler to the car in Japan, where it is sprayed with a thick-laying primer and then hand engraved by a set of master craftsmen before the metallic coat of paint is sprayed onto its flanks. The handcrafted designs are truly wonderful to examine. Not a single round dimple is out of place, to the extent where the entire car appears to have been completed by machines rather than the human hand. In order to eliminate the misconception that the car is covered in an elaborate vinyl wrap, there is a decal on the sticker stating to the public that it is indeed painted. If you ever have the chance to see one of these cars up close, do not pass it up. The complexities of the bodywork and the small details present all over the car will leave you speechless with an exceptional appreciation for the work that was involved, just as it has for me. I could recall countless more happenings from this past year, but I’ll spare you the rest of your day. In all, 2016 has helped breathe new life into annual events, given me a greater appreciation for a wider variety of the automotive world, and opened the doors to several new experiences for me. Hope you enjoyed my recap of 2016 as much as I enjoyed living it. Stay tuned for what is sure to be an even better 2017!